This week's love song is Can't Help Falling in Love performed by Elvis Presley in Blue Hawaii (1961). The long and happy association between Elvis and the state of Hawaii began in 1961, when longtime Presley producer Hal Wallis decided to film the King of Rock'n'Roll's latest film in the newly minted 50th state. Presley's film career started off with a bang in the late fifties with box-office bonanzas like Love Me Tender (1956) and Jailhouse Rock (1957), but Elvis returned to a different world after a two-year stint in the US Army ended in 1960. Presley's comeback film, G.I. Blues (1960), was a big hit, but his attempts at more serious fare -- the Western Flaming Star (1960) and the psychological drama Wild in the Country (1961) -- didn't light up the box office, so Wallis and Presley's rapacious manager Col. Tom Parker decided on a course correction. Presley's next film would be a lightweight comedy featuring lush Hawaiian locales, girls and plenty of songs. 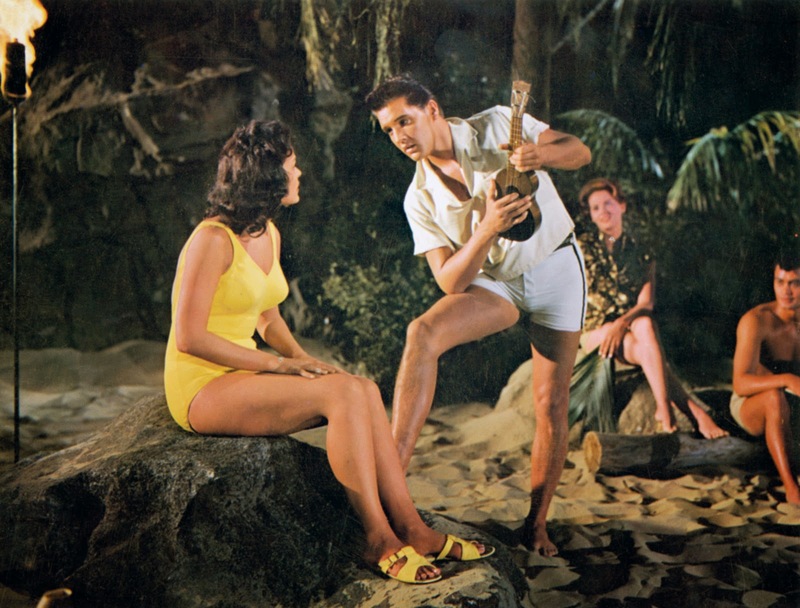 Blue Hawaii was a smash hit, and the soundtrack still remains Presley's best selling album. The film created many hit songs, but Can't Help Falling in Love has a special place in Presley's catalog. The song, written by George David Weiss, Hugo Peretti and Luigi Creatore, was based on a French folk song, Plaisir D'Amour (Elvis says as much in the film). The clip above shows Elvis performing Can't Help Falling in Love to his lady love (Joan Blackman) and her grandmother (Flora Hayes, who at one point served as a Congressional representative from Hawaii) while backed by an Hawaiian band. Presley's acting is somewhat wooden (he probably looked at a fried peanut butter and banana sandwich with more interest than he does at Blackman), but the song is lovely nonetheless, and Presley does a beautiful job with the vocals. Presley was very fond of Can't Help Falling in Love and it was always a highlight at his legendary concerts (clip below). Since 1961, Can't Help Falling in Love has become a standard, recorded by everyone from Andy Williams to Bob Dylan. The song was a huge hit in the nineties for the British reggae group UB40 and it was re-introduced again in the 2002 animated movie Lilo & Stitch by the pop group the A-Teens. Can't Help Falling in Love has even been adopted by English football supporters. It is the official song for supporters of the Sunderland football club, nicknamed the black cats. The clip below shows them singing a rousing version at a match.